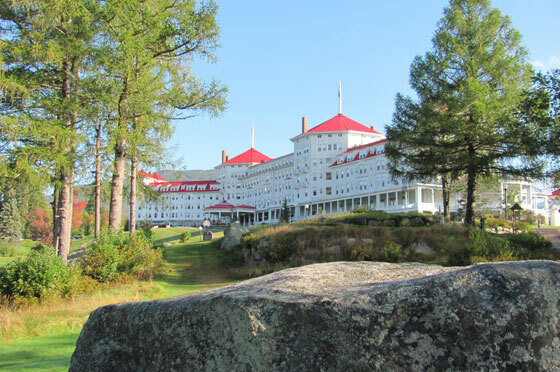 New Hampshire’s Omni Mount Washington Hotel in Bretton Woods is one of New England's most celebrated and historic hotels. Complimenting the grand history of the hotel is a pair of golf experiences equally as grand. The 1915 Donald Ross’s 18-hole championship Mount Washington Course may receive the lion’s share of attention at the resort, however, it is not the only course of historical significance at the resort and it is also not the oldest layout on property. The first golf fanatics began playing on a 9-hole routing that predates the Hotels 1902 beginnings and dates back to the mid 1890’s. The 9-hole Mount Pleasant Course was first laid out in 1895 by Alexander Findlay who, in some circles, is considered the “The Father of American Golf”. In April 1887 this Scottish immigrant became the first man on record in the United States to construct a golf course and play a round of golf on his own design. A tireless promoter of the game, Findlay went on to design 100’s of courses during a career which spanned nearly 40 years. Findlay was also one of the finest golfers of his time and was the first golfer in history to shoot a 72 in a championship tournament over an 18-hole course. This accomplishment of ‘averaging four strokes per hole’ marked the beginning of the modern regulation for par. In 1989 Canadian golf architect Geoffrey Cornish and his partner Brian Silva restored and upgraded the layout. Rumour has it that golfing greats Gene Sarazen and Ken Venturi were on hand to consult on the project. The course is laid out on the valley floor in the shadows of the Hotel along the banks of the meandering Ammonoosuc River. Cornish and Silva crafted a four tee block routing ranging from the 2046 yard junior tees to the back tees at 3215 yards which offers any golfer, experts and beginners alike, a really fun experience. The landing areas on many of the holes are fairly generous and open from the front tees accepting the less than perfect shot from the beginner. However, the more accomplished golfer will be tested from the back tee which serves up some challenging driving angles followed by tricky approaches to subtly sloping greens. Although bunkering is at a minimum they are well placed and will affect the decision making process on the vast majority of shots. In addition to the sensible use of tee block yardages Mount Pleasant has implemented a two cup system on each green. Accompanying the regulation 4.2 inch cup is an oversized cup measuring 8 inches in diameter. The traditionalist can fire at the regulation cup while the larger cup presents the novice player with a greater opportunity for success which makes for a more enjoyable round. Also, for those pressed for time the layout offers a 6-hole loop. The teeing ground for the opening hole is perched well above the fairway level and presents a spectacular view of the distant White Mountains and the Ammonoosuc flowing through the valley just beyond the first green. The ideal drive off the first tee of this long, slightly double doglegged par five, must take the wind into consideration for the fairway below is void of flanking trees therefore exposed to the elements. Keeping the ball in the short grass is a must for the rough can be thick in places. Long hitters trying to reach the green in two will find the task difficult indeed for the green is tiny and protected by a lone bunker directly in front of the putting surface. The prudent play is to place your approach some 50 to 60 yards shy of the green at the corner of the dogleg which will leave a nice angle for the approach taking the bunker out of play. The fourth hole is the first of a three-hole stretch where elevation will influence your club selection process. Routed around and over a sizable hill and, unlike the balance of the course, is lined with thick forest. Careful and thoughtful club selection for the tee shot is a must to allow for the correct distance to the corner of this sharp dogleg left. Too long off the tee risks driving through the fairway and flirting with a collection of bunkers or white stakes and the ball coming to rest too short risks being blocked out by a large stand of trees at the inside corner of the dogleg. An extra club will be needed on the approach to an elevated false fronted green that slopes severally front back to front and a front right bunker needs to be avoided at all costs. Hole number eight is beautiful short par 3 measuring a mere 125 to 150 yards but has plenty of teeth and should not be taken lightly. The flight line skirts the Ammonoosuc and any shot missed right will find the sandy shoals of the river while the bailout left will have your reaching for your sand wedge. The prevailing wind blows down the valley from behind and over your left shoulder which can make club selection tricky. 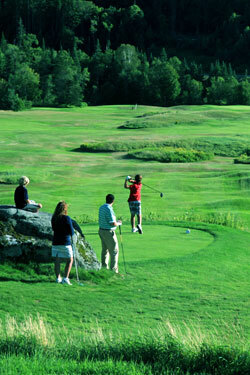 The Mount Pleasant Course is a favourite for families visiting the resort and it complements the longer tougher Mount Washington Course nicely, however, for the accomplished golfer it is an honest test and worth experiencing should you find yourself in Bretton Woods with your clubs in the trunk.